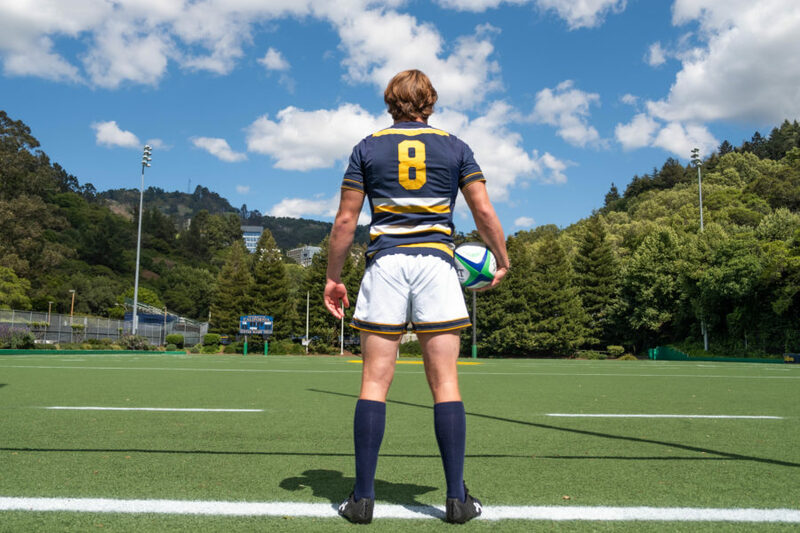 For much of his life, Thomas Robles — a fifth-year senior on the Cal rugby team — was most comfortable with skis on his feet, packed powder beneath them and a nearly 40-degree slope in sight. He had a knack for slopes, but the horizon of the San Francisco Bay and the massive, vertical Campanile would become the angles that shaped Robles’ life. Once an adept skier, even earning himself a spot on the U.S. Junior Olympics squad, Robles eventually found his way to the rugby field. But his story doesn’t begin at Cal. On a calm Wednesday night in 2014, Cal rugby faced Santa Rosa Junior College at Witter Rugby Field. Under a few drops of rain, the Bears’ reserve side secured an easy win over the Bear Cubs. That night, however, was much more than a simple midweek matchup between two Bay Area schools. A Santa Rosa freshman at the time, Robles turned this loss on the field into a lesson that would pave the way to the rest of his life. bringing pushed him toward this goal as he refused to make excuses for himself or accept failure as an option. While most collegiate rugby players come from a high school football background — as Robles did — very few, if any, can include professional skiing on their résumé. Robles’ parents have been active skiers for much of their lives, and Thomas was only 14 months old when he first slid over the snow in Squaw Valley, California. His blooming talent started to show even at the tender age of about 4, and Robles continued to dominate as he got older. “They realized that I had a real opportunity to become an elite ski racer, and so my parents got behind me in that venture and it brought me to a point where I was chasing the snow all the way to the southern hemisphere and in the summers to keep skiing,” Robles says. In high school, Robles led two separate lives — the first as an academically inclined football player and the second as an international skiing sensation. Robles traveled from New Zealand to Chile, Canada and sometimes Europe, as well as all around the United States. “What that opportunity allowed me to do was sort of foster my independence and my competitive nature,” Robles says. Robles soon earned himself a spot on the U.S. Junior Olympics team, eventually claiming titles in both super-G and slalom. After his hectic high school tenure, Robles decided to take a year off and focus on his skiing in lieu of heading to college. This step seemed natural, considering his father did something similar and took a semester off from college to work in Squaw Valley. The time off paid off, as Robles rose to No. 1 in his age group for downhill skiing. Once he was at the top, however, Robles made a decision that no one expected. He would leave his title as it stood and head to Santa Rosa Junior College to resume his academics. Robles enrolled as a Bear Cub with the hopes of one day becoming none other than a Golden Bear. Education plays an important role in the Robles family, as several members have been teachers and principals. Even Robles’ grandfather, Ernesto, worked in the government and founded what is now called the Hispanic Scholarship Fund. Thomas also wouldn’t be the first Cal student-athlete in the family, as his cousin Joe was a placekicker on the football team in 2007. When Robles entered Santa Rosa as a student, he didn’t know rugby was in his future. So, how did this sport come into the picture? After a classmate wearing a Santa Rosa rugby T-shirt sat in front of Robles in his first calculus class, he was intrigued by the idea. Robles had heard high praise for the game of rugby from his former high school football teammates, but he had never gotten the chance to play, as he was always busy with skiing in the spring season. With slopes now out of the picture and with some lucky sequences of events, Robles gave rugby a shot. “If I hadn’t seen the guy wearing the Santa Rosa red T-shirt what would I be? … I hope that I’d still be here — I wouldn’t trade this opportunity for anything in the world,” Robles says. Robles’ first opportunity playing rugby competitively was against none other than Stanford, a team Santa Rosa ended up beating in the sevens matchup. Robles also had the chance to watch Cal play in the tournament and was impressed with the Bears’ composure on the field. Fast-forward to that Wednesday night in Berkeley when Robles decided that, along with academics, he also wanted to represent the blue and gold on the field. 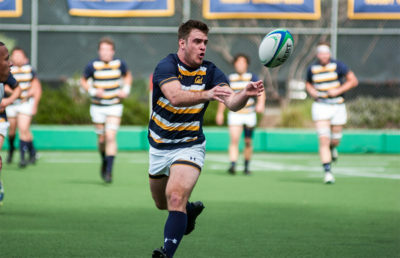 Fortunately for Robles, his junior college team was coached by Cal rugby alumnus Dan Towers. After the match, Towers introduced a couple of aspiring Bears to the coaching staff — among them was Robles. “It’s truly admirable because there’s a lot of young men who were going to the junior college who said, ‘I want to go to Berkeley,’ but … they always find some excuse as to how come they felt short and they weren’t willing to go the extra mile; Thomas has no excuses,” Towers says. Robles’ athletic and academic success at Santa Rosa eventually earned him recognition as one of the top players on the team. Since that Wednesday night in 2014, all of his hard work was aimed at achieving his goal of playing Cal rugby. After an unusually late application process ending in mid-July, Robles eventually received his acceptance letter to be a student-athlete at Berkeley. His parents learned that their son had been accepted into Cal while coming back from a trip in Mexico. They dropped his sister off in San Diego, where she plays college volleyball, and were about to let Robles know that they were on their way back to the Bay. That’s when Robles dropped the bomb that he needed to be at Berkeley in five weeks to start school. Robles’s first year in Berkeley was a blast, as he was crowned with an All-American honorable mention on a championship squad. His senior year, however, ended early with a devastating leg injury — his first major injury despite years of skiing. But, of course, Robles was still active on the team, contributing in meetings and playing a key role in the locker room. He was a natural leader in all senses — a trait that he continues to utilize as a captain in his fifth and final year. Another blow for Robles was the effect of the East Bay fires on his community back home, including the burning down of his high school last fall. Robles, however, is someone who acknowledges setbacks but keeps looking to the future. His final season has been nothing less than spectacular, just like the entirety of his athletic and academic careers both before and after becoming a Bear. His favorite snapshot so far from his blue and gold years is the team’s victory in the 2016 championship game on the road against BYU. Robles’ only goal is to add more memories as he steps onto the field one last time for the national title in Santa Clara this Saturday. 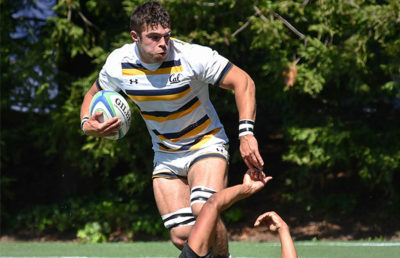 Robles’ impact as one of the key players on a very well-rounded Cal rugby team will be remembered along with his character. “I have an 8-year-old son and a lot of personality traits Thomas has, I hope my son grows up to have the same traits, just because it’s something truly admirable and it’s completely genuine,” Towers says.